Had a great time, highly recommended. Amazing experience. Will always remember the highlight of sailing in Ireland. Loved every minute of the sailing course. Great instruction, wonderful yacht and crew. Can't believe how much I learned and progressed. Beautiful area, wonderful boat, the islands are fantastic. We'll definitely be back for more. Nigel, Bridget & Sebastian from Cheltenham, UK. A great and beautiful day's sailing, fabulous experience considering it was our first time. Wonderful instructor/skipper. We loved it. Stephan, Chrissi, Sahra & Maria from Bavaria, Germany. We had an excellent experience during our week's sailing holiday/ course on the beautiful sailing yacht "Yola". Wonderful instruction, patient tour guide, flexible and a great sense of humour. "It was a lifelong dream of mine for the whole family to go sailing. I was nervous but soon relaxed when I knew we were in safe capable hands. We had an amazing day out around the Saltee Islands and it was was made event more magical by the pod of dolphins who accompanied us for half an hour much to my son's delight!" 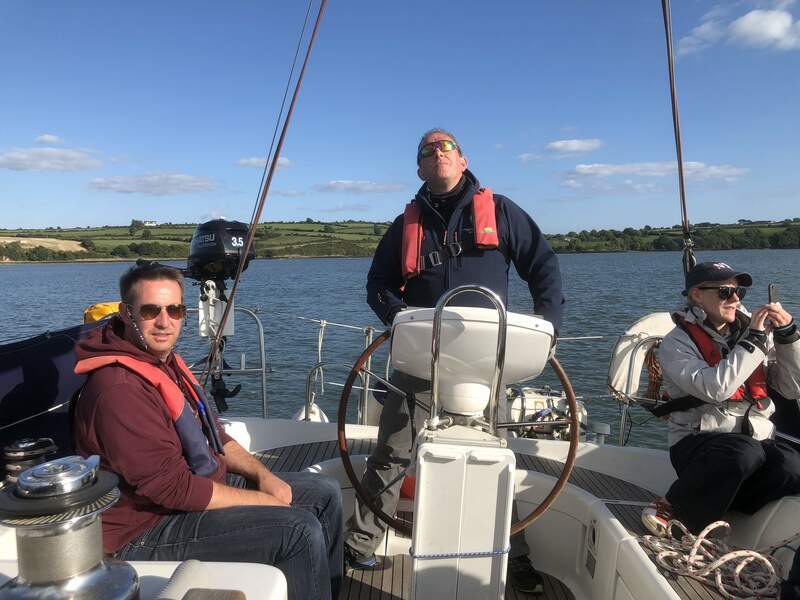 "After completing a Day Skipper Practical and the Coastal Shorebased courses with Sailing Ireland we decided to put our new found skills into practice and try sailing in a different environment. 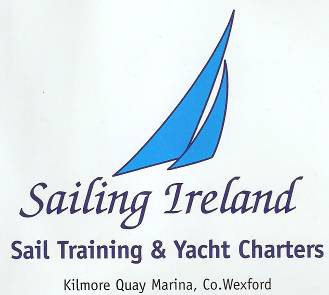 Sailing Ireland helped with the selection of a charter boat and the red tape. We chartered a Bavaria 50 in Croatia and Dermot skippered it for what was a wonderfully relaxing sailing holiday in the sun. His easy teaching style and good humour puts everyone at ease and we learned so much over the week that we could carry out a med. mooring like professionals. Planning our next trip already!" Fancy doing something a bit different this autumn? Well, why not sign up for a sailing course and open up a whole new world of possibilities. Aubrey Gray from Palmerstown in Dublin, age 55, did just that. Having always loved the water and having a life long ambition to sail, attended the annual boat show in the RDS looking for a new challenge and information on learning to sail. Dermot Greer and signed up for an ISA Competent Crew Sailing Course. Aubrey took part in the five day liveaboard course, which set off from Kilmore Quay, Co. Wexford and thoroughly enjoyed it, picking up the basics from Dermot after only a few days of tuition. Aubrey took Dermot’s advice to get some more time on water through signing up as an available crew for cruises or delivery trips. Dermot was delighted when Aubrey was in touch a few weeks later to say that he had just returned from a delivery trip of a lifetime. With just a competent crew course behind him Aubrey had taken part in delivery trip to the Caribbean from Grand Canaria to St.Lucia on board a 46 foot catamaran. The Trans Atlantic trip took 19 days and followed the route of the ARC (Atlantic Rally for Cruisers). Aubrey loved the trip so much he decided to get more sailing skills under his belt. Last winter he attended Sailing Ireland’s ISA Yachtmaster Coastal Skipper Navigation Theory Course, run annually by Dermot Greer in Wexford Harbour Boat & Tennis Club. These new skills were then put into practice on Sailing Ireland’s annual cruise to the Isles of Scilly off Cornwall, on board Yola, a Jeanneau Sun Odyssey 37. Aubrey gained confidence and honed his skippering and navigational experience. Following the cruise he also took and passed his VHF Radio Course and since then has also become the proud holder of an ISA Day Skipper Certificate, both courses taken with Sailing Ireland. Aubrey has certainly gone from Landlubber to seasoned sailor in a year and he plans to get as much time on the water as possible over the coming months. He plans to go further with his sailing and hopes to have his own boat one day. He is available to assist in delivery trips and general day sailing. Aubrey has signed up for another trip to Cornwall and the Isles of Scilly again this coming June. If you’d like to follow in Aubrey’s footsteps and learn to sail contact Principal Instructor Dermot Greer, Sailing Ireland on 086 171 3800.